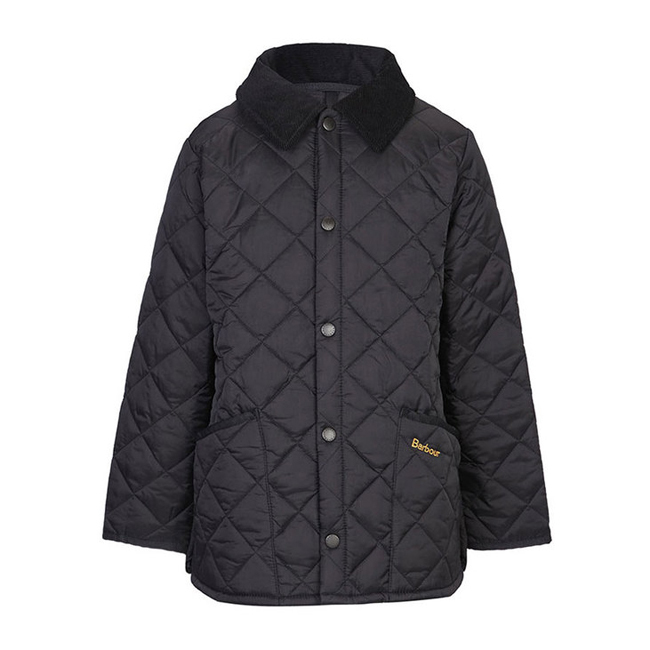 The iconic Liddesdale quilted jacket is scaled down to make a special boys' version of this popular jacket, available in five colours from the boys' Country collection. Made with the same smart fabric and lightweight wadding as the men’s Liddesdale, this boys' jacket is a classic jacket that’s perfect for everyday winter wear. An easy-to-fasten snap-close front, cord-trimmed patch pockets, contrasting cord collar and signature diamond quilt give the traditional Barbour quilt look. Inside, a zip-close hidden pocket is perfect for stashing important little items or pocket money. Perfect fit, warm and cozy is how my daughter described it. Quality is very good. Price is right! Happy Customer. I am 6'0" and 165 lb with 33 size waist and bought two Red colors in M and one Super Blue in L size to compare and chooe one. There is a bigger than expected size difference between the M and L sizes. I usually opt for the large in many jackets and tops I buy because I have very broad shoulders but lean body, but in this case the Large was bulky. It is very wide cut especially around the waist. It depends on how you want it to fit; Just as a rain jacket, the large is fine with room for a sweater or sweatshirt when it's cold I would choose the large for hiking. The Medium fit just right, looks good even for a casual wear with not much room for a bulky sweater but can wear a sweatshirt or long sleeve T-shirt under it for warmth. Mind you, all pictures were taken while wearing a t-shirt only. Also there is definitely a slight but noticeable cut difference BETWEEN THE TWO MEDIUM sizes I purchased caused probably by period of production and slight design changes that accompanied it. For starters the Rocket Red fit me more nicely with a slightly more room around the shoulders and wider overall cut and the mesh was softer and more fine. overall more comfortable to wear. The Mountain Red was a little snug around the shoulders and sides and the mesh is definitely coarser on my arms which is fine, but since I have broad shoulders I chose the Rocket Red. The Mountain Red had a solid polyester fabric right below the collar where the Columbia tag is for durability, but the Rocket Red was soft mesh all the way to the edge of the collar. Also the mesh interior is more fine and softer on the Rocket Red than the Mountain Red. Also the Blue one has fine soft mesh also and missing the collar solid polyester fabric. I would bet the Rocket Red is a discontinued product since it's not offered on Columbia.com as well as many of the colors offered here on Amazon. So I can assume the colors here that are not offered on Columbia's website are probably discontinued and will have a softer mesh and fit a little bit more loose or classic fit. I guess Columbia upgraded it to make it more durable around the neck area and fit more modern a little bit. I would also like to add about one other review that said quality defect in one pocket being sewn all the way to the hem but not the other pocket(Left pocket), IT IS NOT A QUALITY ISSUE, that pocket is where you pack the jacket. it has a two sided zipper, so you can turn the pocket inside out and pack the whole jacket inside, so it's intentionally sewn that way. All the three jackets I got where sewn like that. It will have a patch near the zipper pocket that says PACKABLE. Overall really nice quality jacket as to be expected from Columbia, and a steal on these prices, in stores it usually is twice.